Amidst the catering proposals and guest lists, an important (and fun!) item on your wedding checklist is choosing where to escape after the big day. As the list of best honeymoon destinations grows, so do their offerings. Your ideal spot for romance will have plenty of options for accommodations, dining, and activities to keep lovebirds entertained on their vacations. But it can come at a cost – a 2015 survey by WeddingWire reported that newlyweds spent an average of $3,882 on the big trip. If you’re looking to fund your honeymoon through your registries, Blueprint Registry can set you up with cash gifts that contribute to the trip of your dreams. Whether you’re looking to blow that budget or keep it more frugal, decide what type of honeymoon is best for you and your spouse. Are you adventurers who love to be outdoors? Are you beach bums? Or would you feel the love in the middle of a romantic European city? Whether you’re headed out the day after the ‘I Dos,’ or waiting a few months before your escape, here are the best honeymoon destinations to seek out with your new spouse. 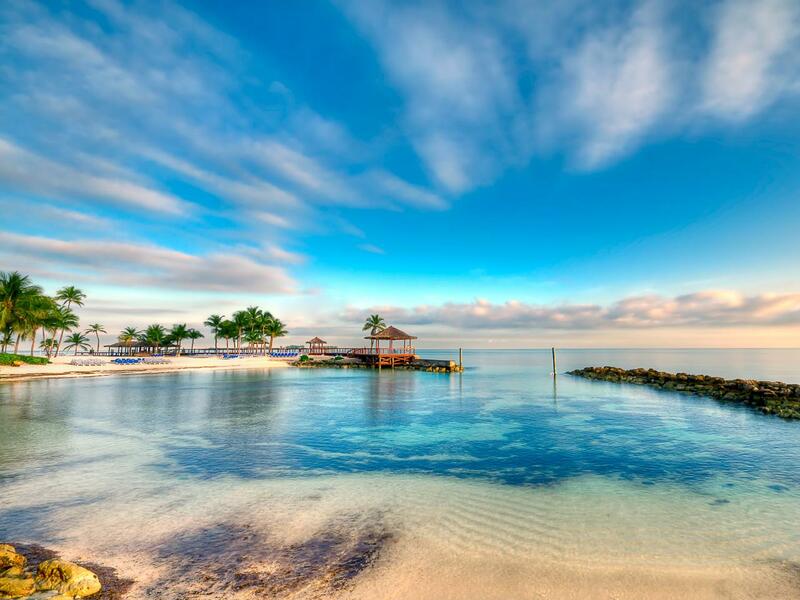 A tropical vista is the honeymoon we all know and love. Sun and sand will always have a place in newlyweds’ hearts, and more exotic locations are making even all-inclusive resorts feel totally exclusive. A relaxing vacation can seem like a beacon of light during stressful wedding planning, but don’t bank on laying on the beach for seven days straight. Chances are, your skin and your sanity can’t take the heat – so schedule a few activities in. Ranked at the very top of The Knot’s 50 Best Honeymoon Destinations, everyone knows French Polynesia is the place to be after your nuptials. Lavish resorts (ex. 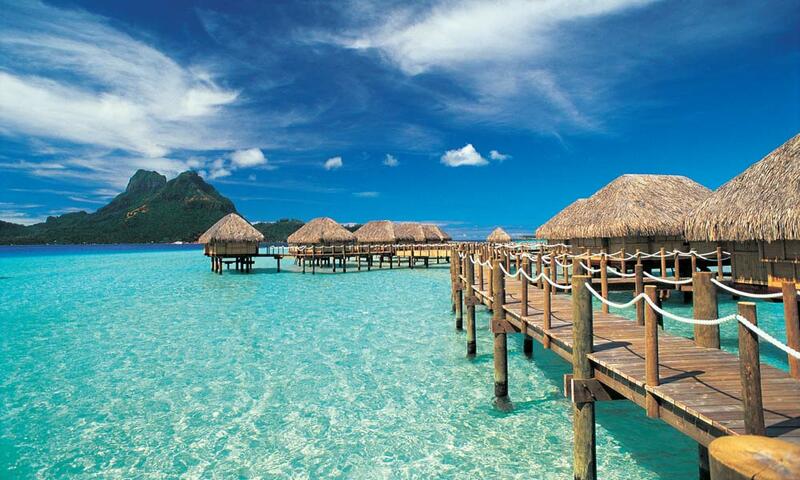 the Four Seasons, or InterContinental) are situated upon stilts over crystal blue waters, surrounded by coral reefs. Relaxation at it’s finest. 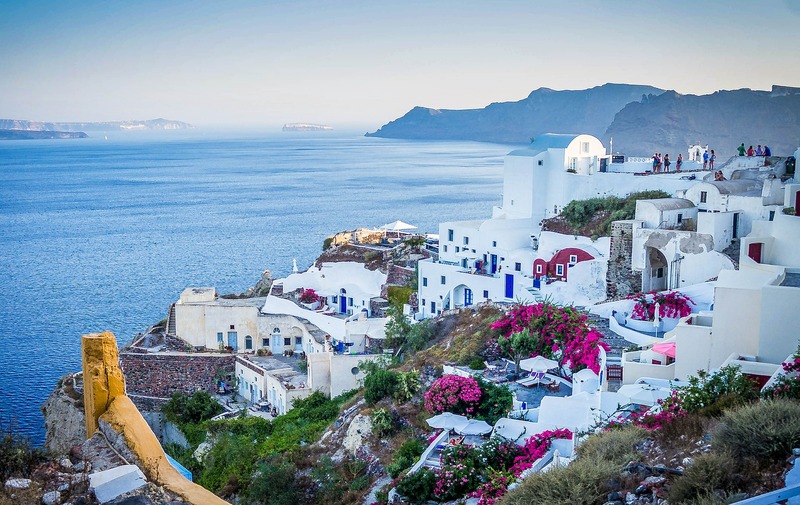 The volcanic island of Santorini always tops the list of dream destinations. Cerulean blue waters (and rooftops) make it a favorite for those looking to both relax on its black sand beaches and explore ancient local culture. And you can cap off every day with Santorini’s unbelievable sunsets. 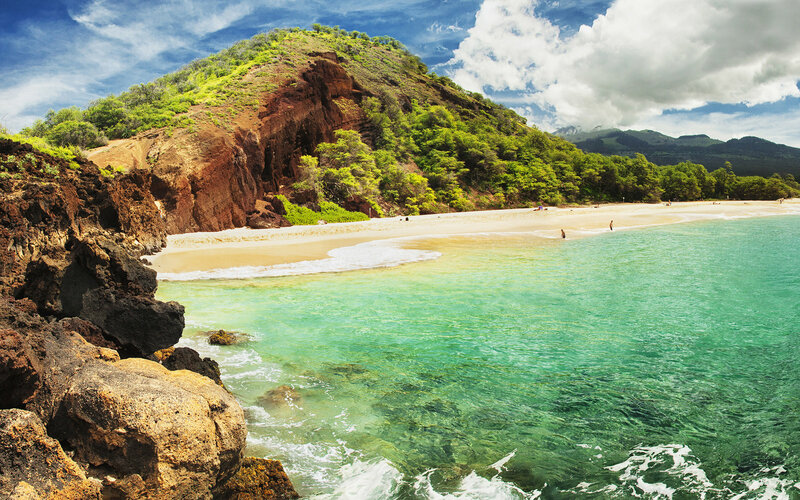 Hawaii is America’s ultimate beach getaway, and Maui remains the place to be with luxurious resorts set on beautiful beaches. Plus, Maui honeymooners enjoy lush hiking, water sports, and the ever-important luau experience. 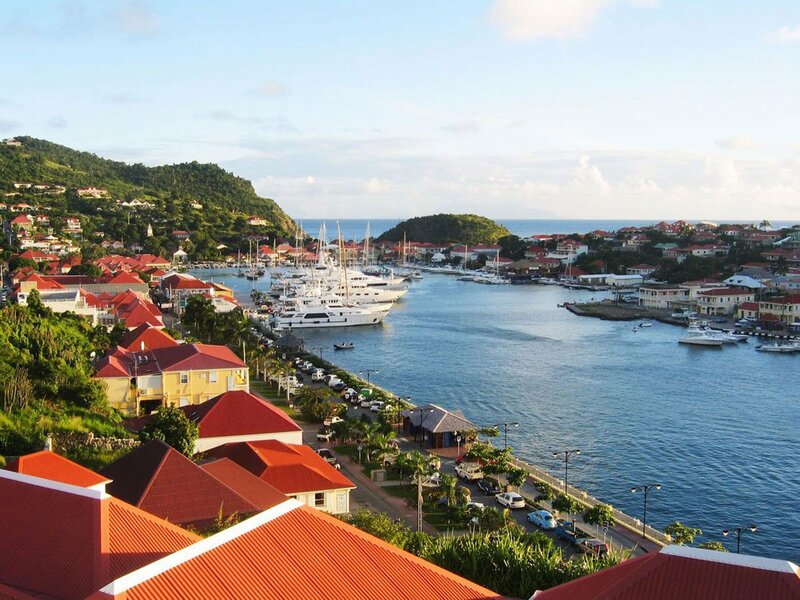 St. Barts is a little piece of lavish France, without the cross-Atlantic flight. This Caribbean getaway made a name for itself as a high-end honeymoon destination. With 22 (!) white sand beaches and Instagram-worthy architecture, it’s easy to see why celebrities and honeymooners alike choose it for beach bliss. Couples who love nature and exploring are often drawn to honeymoons that take them to breathtaking destinations. Whether hiking in national parks, alpine skiing in snowy mountains, or exploring a rugged wilderness – the great outdoors can be wonderfully romantic. You’ll be hard-pressed to find an all-inclusive National Park honeymoon package, so prepare to do a lot of planning beforehand, including acquiring any gear you might not have to hit the trail or the slopes. 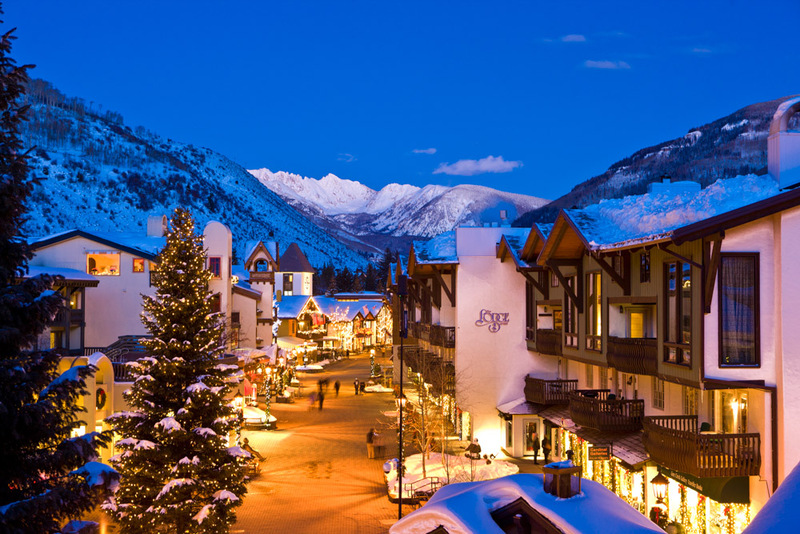 Vail is one of the most recognizable names in winter ski destinations, but it doubles as fantastic summertime honeymoon spot as well. In any season, Vail’s lavish resorts combine fresh air with fine dining and spa treatments after long days on mountains. 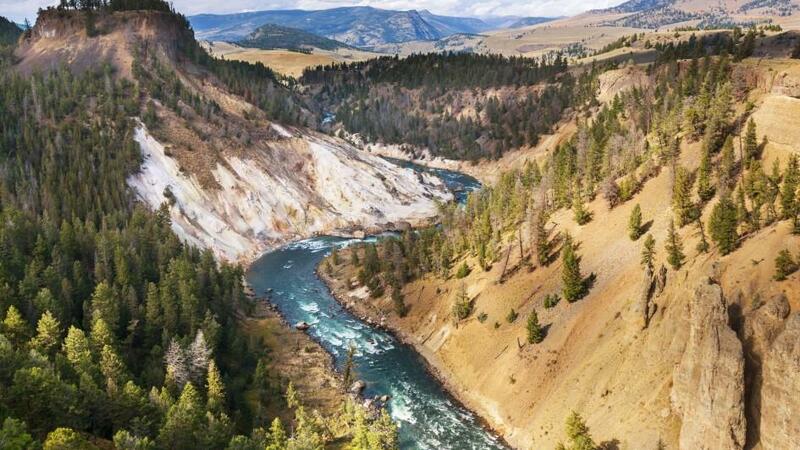 Covering parts of three states, Yellowstone is America’s first National Park, and remains a gem of the NPS. There are endless ways to enjoy the park, but honeymooners often opt for the rustic, iconic Old Faithful Inn. 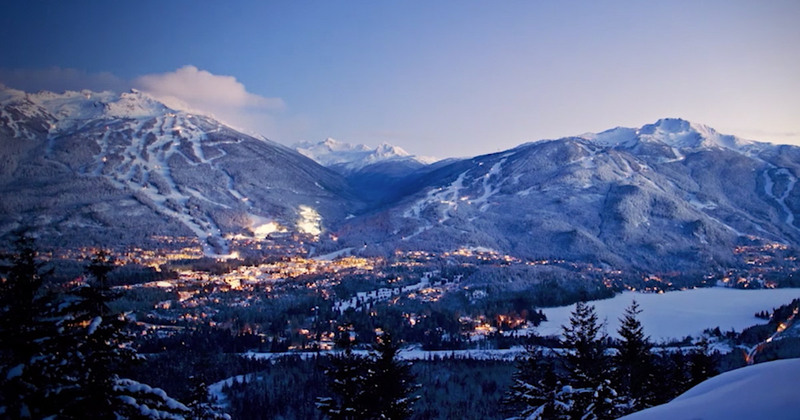 The secret’s out about the epic mountain town of Whistler, B.C. Australians have flocked here for years for world-class skiing and luxurious accommodations, and it’s becoming a popular choice for adventurous honeymooners. Couples can also spend a few days on nearby Vancouver Island for a remote-island feel with superb views and wildlife. Urban exploring is a popular honeymoon choice that gives newlywed the chance to immerse themselves in foreign culture. Popular travel destinations are marked by stunning architecture, notable sightseeing and exquisite cuisine. In the high season, traveling in popular cities can get expensive, and busy. Consider visiting in a shoulder season to avoid crowds and cost. 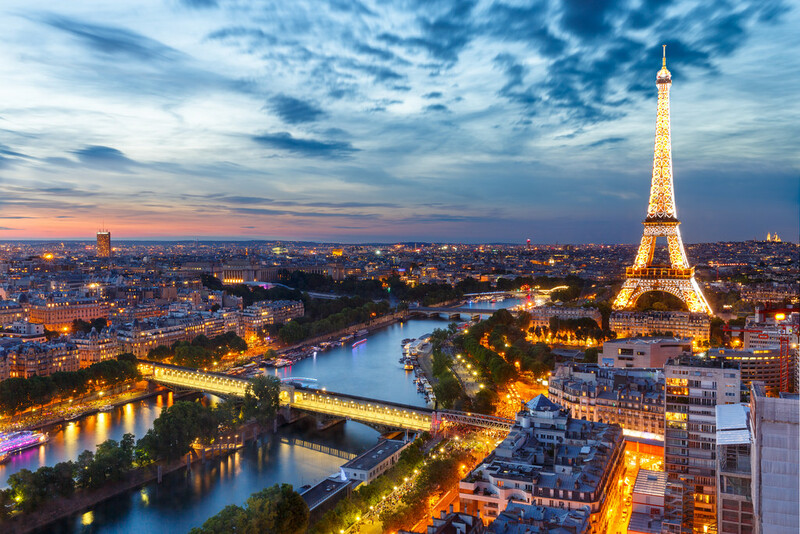 It’s no surprise that the City of Light tops the list of urban honeymoon destinations. With endless options for sightseeing, fine dining, and easy afternoon strolling — especially along the River Seine — it’s no wonder that couples choose the French capital for their voyage de noces. Just a few hours apart via Italy’s world-class high-speed train, Florence and Venice come in at #9 and #10 on US Travel’s 20 Best Honeymoon Destinations. 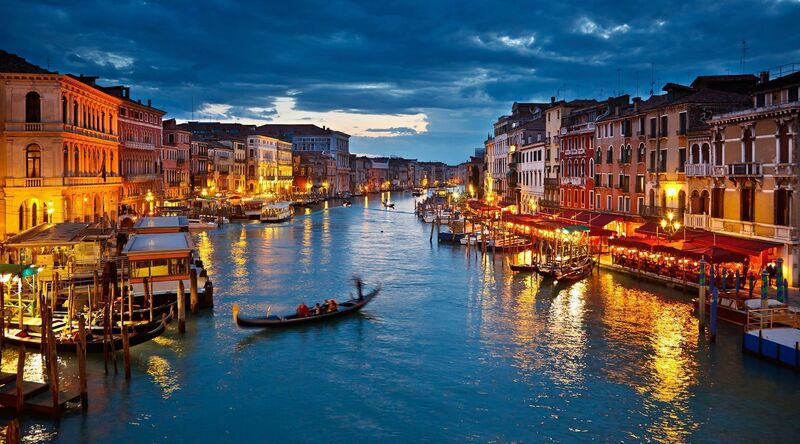 From the red-roofed Tuscan town of Florence, to the dreamy blue waters of Venice’s canals, these Italian destinations are endlessly romantic. Amsterdam has recently seen a surge in honeymooners, eager to explore the city’s canals, iconic architecture, and rich history. Couples can enjoy high-end hotels lining the storybook waterfront, and explore the city via bicycle, as the locals do. 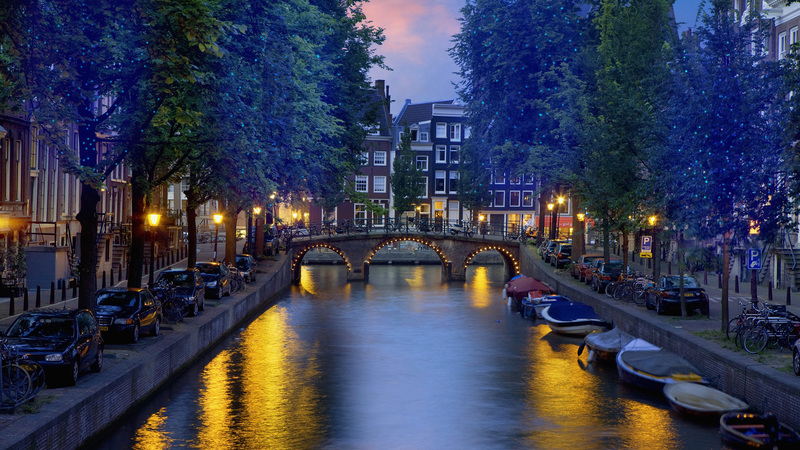 And for those who love nightlife, there’s plenty to be had in Amsterdam. Cruises give couples the opportunity to see several different locations, without the hassle and planning of transportation and accommodation for each. And it’s not just about the destinations — today’s luxury cruises offer amenities that rival resorts on land. Do your research and choose a cruise line you love and trust before booking. Otherwise, you might be setting yourself up for a couple weeks of bad food and service. 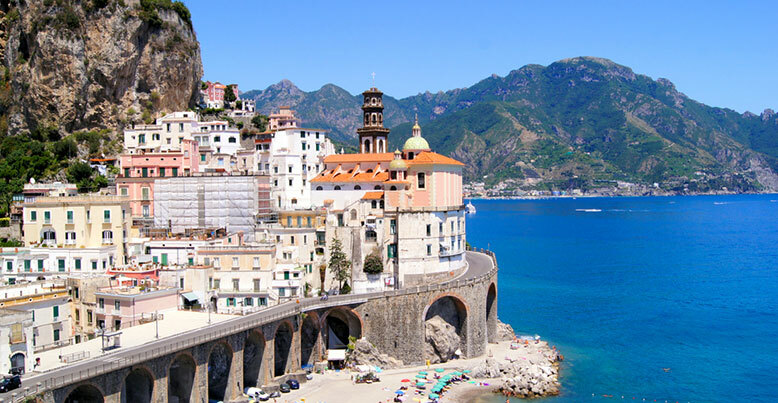 For those looking to get the most out of the Mediterranean, a cruise is the way to go. Cruise lines, such as Seabourn, offer 7-, 14-, and 21-day routes traveling the warm waters from Greece to Spain, with several stops along the way. Caribbean cruises have gotten a bit of a bad rep, but smaller ships with more remote destinations are transforming the experience into luxurious island hopping. Because beaches > buffets. 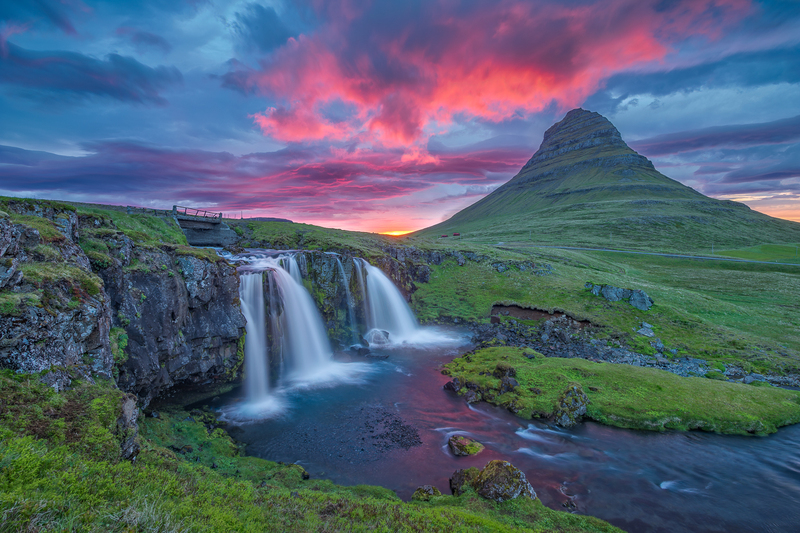 Windstar Cruises, the world’s smallest luxury cruise line, began their “Around Iceland” route last year. Over seven days, guests stop at five islands off the coast in a newly designed, 200-person ship. And with Icelandair carrying more routes now than ever before, getting there isn’t a problem. Whether your constraints are budgetary or schedule-related, a mini-moon is a name for an extended weekend’s romantic getaway. Because long travel times and long weekends don’t align, choosing domestic destinations mean they’re easy to get to, but far from boring. Just because you’re keeping it domestic doesn’t mean it’ll be cheap. Especially if you’re mini-mooning to save, keep your expenses in check as you book your weekend away. 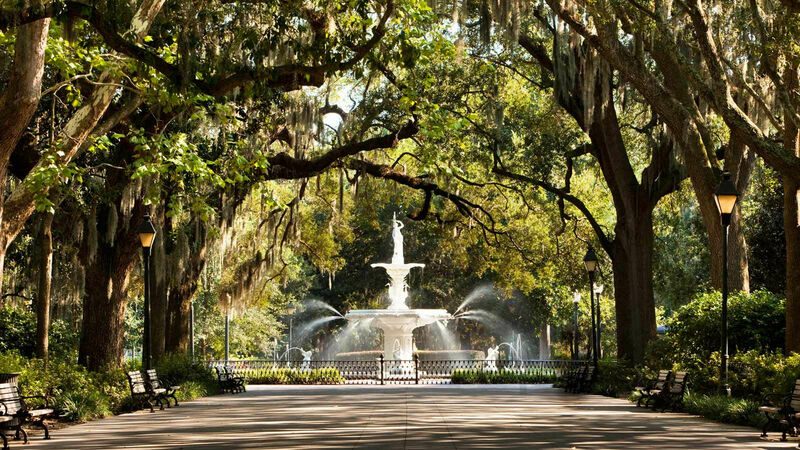 Savannah might not be first of mind when you think of romantic destinations, but its rich culture set to the backdrop of picturesque cobblestone streets make it a perfect mini-moon spot. Couples can investigate civil-war history, marvel at mansions, or simply snuggle underneath the canopy of the famous Southern Live Oaks. 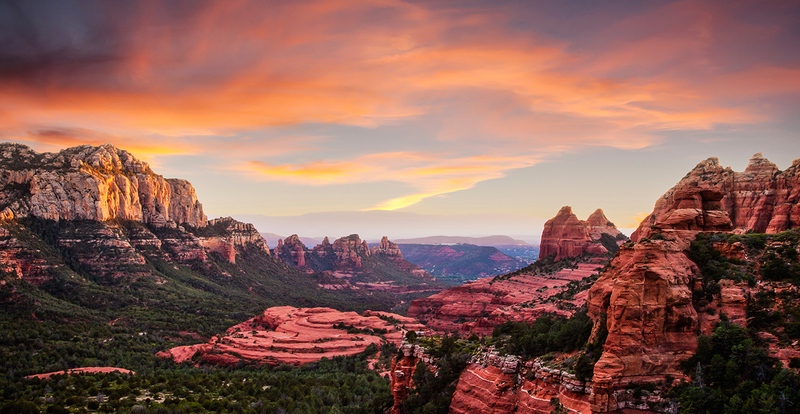 Surrounded by red rock formations in the Arizona desert, Sedona is known for both its outdoor and art scenes. Southwest style reigns in accommodations such as Enchantment Resort, which are perfect for newlyweds are tucked away in this stunning landscape. Spend a weekend relaxing in revered wine country. 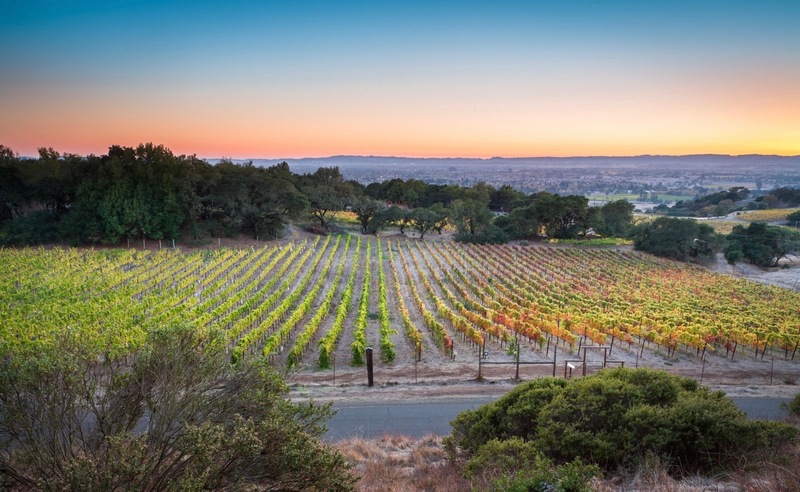 Whether you’re well-versed wine connoisseurs or simply there for the sunshine and scenery, there’s something for everyone in Napa Valley. And since you’ll fly in and out of San Francisco, schedule some time to sightsee — or at least cross the Golden Gate Bridge. Whether it’s on sunny beaches or snowy slopes, in a foreign city or just a short drive away, your honeymoon should be a getaway that offers both relaxation and invigoration for your and your new spouse. No matter where you decide to go, explore local culture and balance activities with some R&R. After all, you both deserve it. Happy Honeymooning!